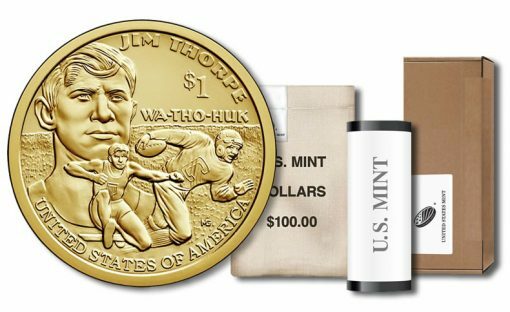 At noon ET today, Feb. 15, the United States Mint will release rolls, bags and boxes of circulating quality 2018 Native American dollars featuring sports legend Jim Thorpe. Thorpe was born in 1887 and a member of the Sac and Fox Nation. He would become the first Native American to win an Olympic gold medal for his home country. He was also known for being extremely versatile in his athletic abilities and participated in many sports. 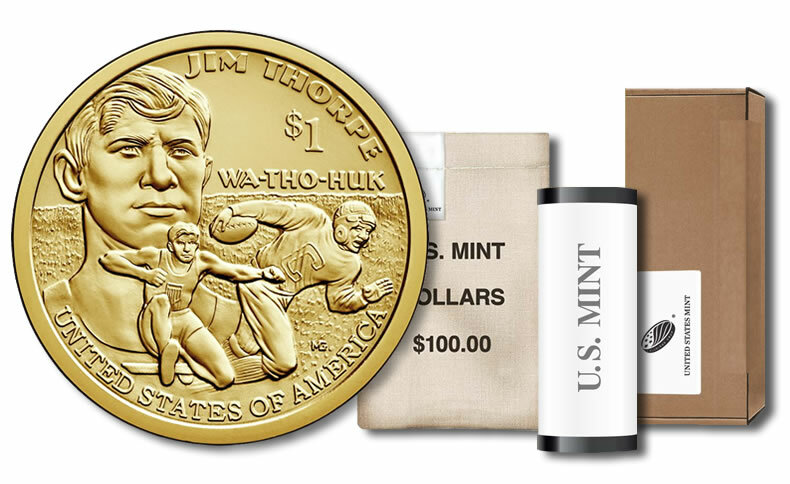 Buyers may choose between 25-coin rolls, 100-coin bags, and 250-coin boxes of Jim Thorpe Native American $1 Coins. 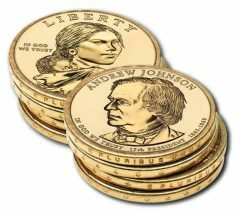 All showcase U.S. Mint branded packaging and contain dollars from the U.S. Mint production floors in Philadelphia or Denver. 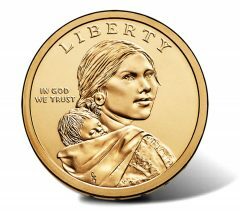 Authorized by Public Law 110-82, the dollar appears as the tenth in a series showcasing annually changing reverses honoring Native Americans and the important contributions made by Indian tribes or individuals. Jim Thorpe’s design was publicly unveiled in December following a review process that included 15 candidates. 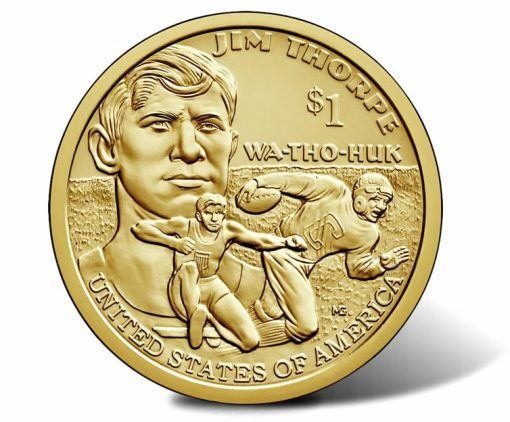 Created by Michael Gaudioso, it depicts a profile of Thorpe in the background with highlights of his achievement in football and as an Olympian in the foreground. Inscriptions include JIM THORPE, UNITED STATES OF AMERICA, $1 and WA-THO-HUK (Thorpe’s Sac and Fox tribe name). 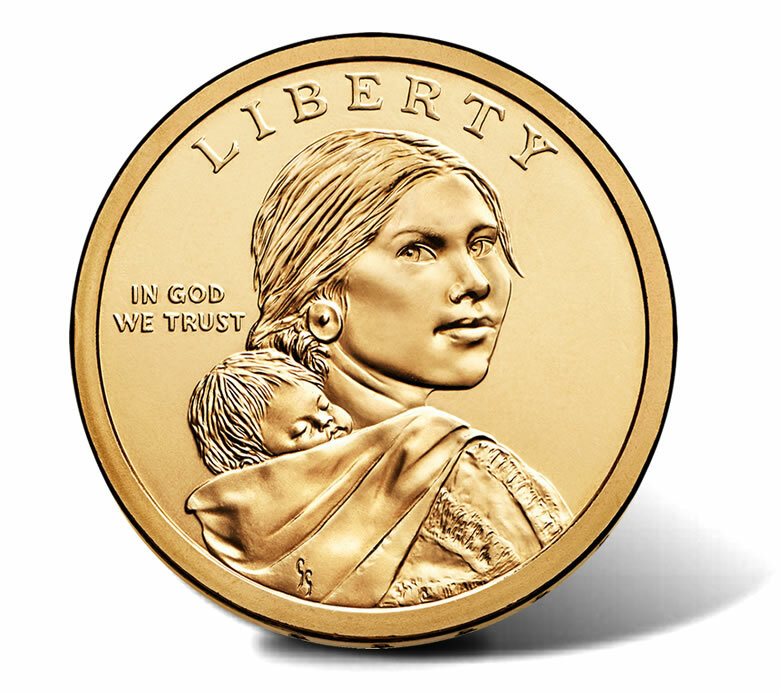 All coins of the series have the same obverse (heads side) portrait by Glenna Goodacre of Sacagawea, which was first seen on the 2000 Sacagawea golden dollar. Obverse inscriptions read LIBERTY AND IN GOD WE TRUST. 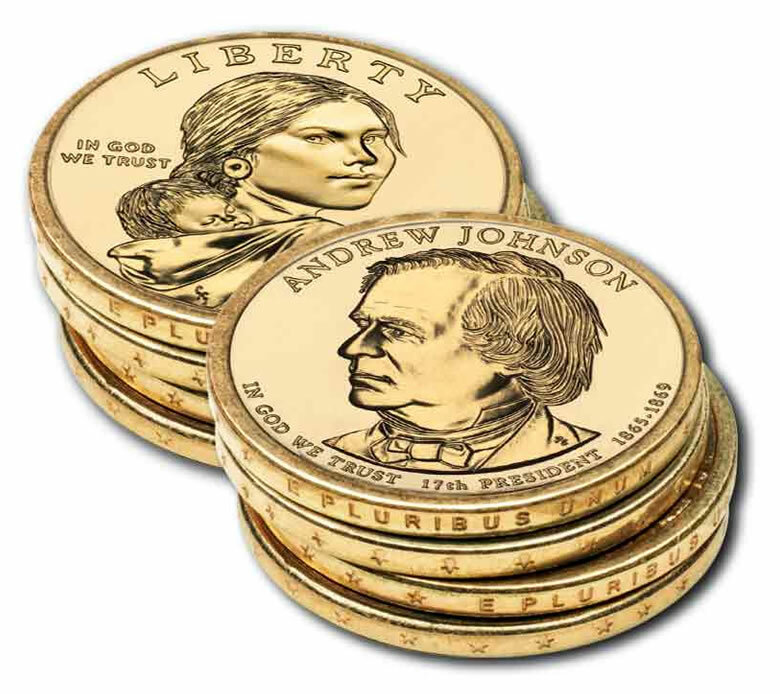 Dollar coins have edge inscriptions of the year of issue, mint mark, and E PLURIBUS UNUM. A ‘P’ indicates coins produced at the U.S. Mint’s Philadelphia facility whereas a ‘D’ represents those produced at the facility in Denver. 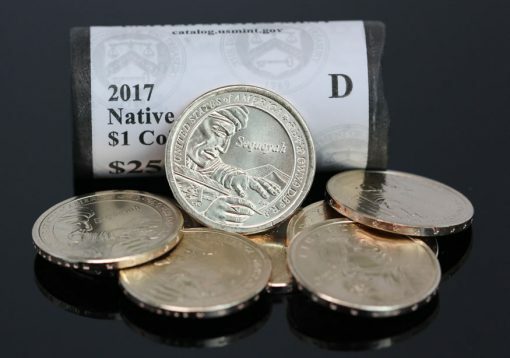 A CoinNews photo of a D-roll of last year’s 2017-Native American $1 Coin. Its reverse design featured Cherokee silversmith and inventor Sequoyah. All are featured in circulation quality, but have never actually been released into circulation. 2018 Native American $1 Coins may be ordered directly from the U.S. Mint using this online page. Phone orders are accepted by calling 1-800-USA-MINT (872-6468). No mintage, product or household limits are in place. Since the series debut, mintages have been trending lower. The big drop after 2011 is the result of dollar coins no longer being actually issued into circulation. They are produced in circulation quality only for issuance in numismatic offerings like roll, bag and box products. *In January of each year, the U.S. Mint tends to strike dollar coins to the expected amounts needed for the entire year. There have been instances where more are made beyond January. i don’t see it on the mint website, but is there any plans for a coin and currency set this year with this coin either enhanced or proof? This year U.S.Mint will make reverse silver proof set., it will contain the dollar coin at reverse proof version. I wish this reverse silver proof set contain all coins at .999 silver . Like Canadian Mint did.